EJOLT Report 5 (High resolution) for printing. After 1992 many conservation biologists thought that the use of economic instruments would be more effective to halt biodiversity loss than the policies based on setting apart some natural spaces outside the market. At the same time there was a new elaboration of the concept of ecosystem services and, since 1997, there were attempts at costing in money terms the loss of ecosystem services and biodiversity including the high profile TEEB project (2008-2011). Our discussion rests on instances showing the analytical implications of three main socio-economic meanings of biodiversity loss: a) the loss of natural capital, b) the loss of ecosystems functions, c) the loss of cultural values and human rights to livelihood. 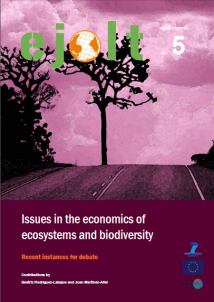 We review several approaches to include economic considerations in biodiversity conservation. We show cases where monetary valuation is relevant and other cases where it is controversial and even counterproductive, as it undermines the objectives of conservation.